"Queen Mary 2, the most magnificent passenger liner in the world, demands a magnificent painting. This is certainly it!" - Stephen M Payne OBE, QM2's Chief Designer, May 2014. In June 1999, Cunard Line announced plans to build a new Queen liner - to be the first true transatlantic passenger liner since QE2 began service in 1969. Cunard stated, "Our goal is... to create a new Golden Age of sea travel for those who missed the first". And so began the 1 million-hour design process led by British naval architect, Stephen Payne OBE, of what would become the largest and most expensive passenger ship ever built. At 151,400 gross tonnes and 1,132 feet long, Queen Mary 2 took a further 8 million hours to build. 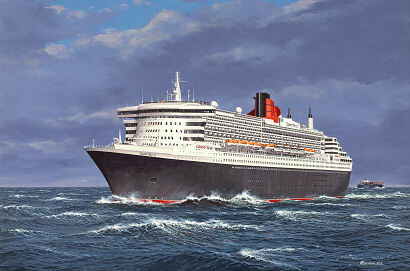 In 2000, Cunard commissioned maritime artist Gordon Bauwens to produce their official Artist Impression of the planned new flagship plus several paintings to hang aboard the new liner when she entered service in 2004. During her first decade in service, QM2 carried 1.3 million passengers and logged almost 1.5 million nautical miles (equivalent to three return journeys to the moon). In July 2013 she completed her 200th Atlantic crossing, by which time she'd also served no fewer than 58 million meals! While aboard for QM2's special 10th Anniversary transatlantic crossings, guest speaker Stephen Payne OBE launched his new book, "RMS Queen Mary 2: Owners' Workshop Manual" together with our "QM2 ~ Ocean Sovereign" art prints. These highly detailed and atmospheric signed prints are faithfully reproduced from the original oil painting by Gordon Bauwens. They feature the mighty QM2 effortlessly throwing aside the North Atlantic swell, for which she was built, and are printed on quality art board using fade-resistant inks. Art prints featuring Cunard's mighty flagship, mid-Atlantic. Each signed by Stephen Payne OBE and artist Gordon Bauwens.